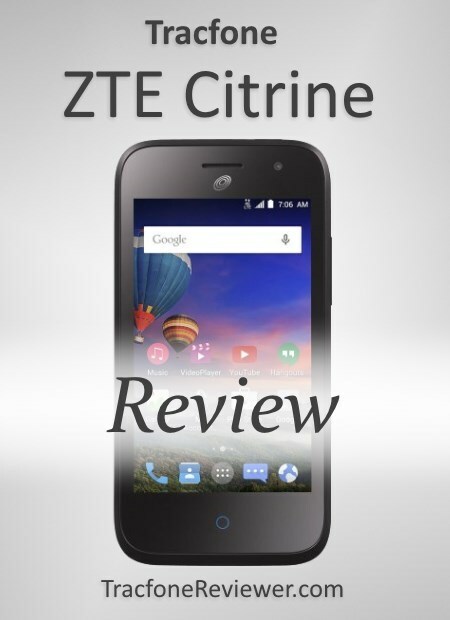 This review of the ZTE Citrine is created by TracfoneReviewer. We have many more full reviews on our Cell Phone Reviews page. 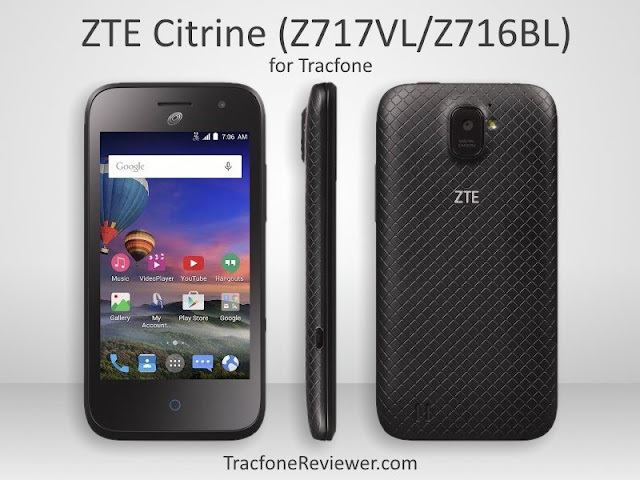 The ZTE Citrine is a small, inexpensive Android phone available from Tracfone for either CDMA or GSM networks that actually packs many similar features and specs found in larger, more expensive devices. Is this phone the best smartphone from Tracfone for under $50? We will answer that, and share the full specs, features, and details about this phone. 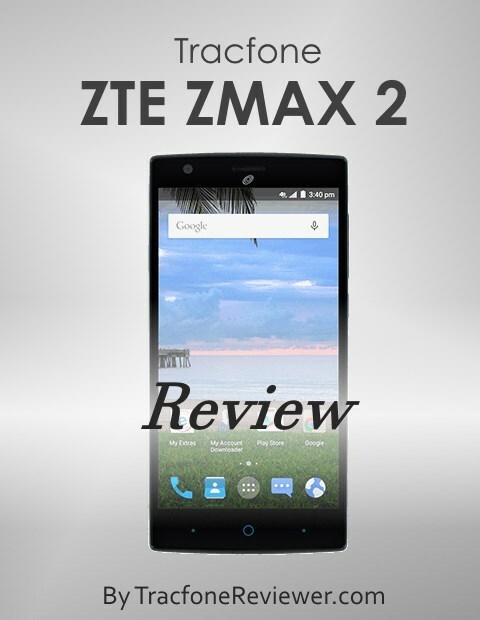 We will also give our review, and where to buy this phone at the best price. Tracfone has been releasing a large number of budget smartphones during 2016 including many ZTE, LG and Samsung devices. You can catch up on what phones are coming out or already released by checking out our posts on New LG and Samsung Tracfone Smartphones and New ZTE, Alcatel and Huawei (Nexus 6P) Tracfone Smartphones. With the Citrine, the main feature is the low cost, but there are some other good things about this phone. Let's take a look at our quick pro's and con's for the Citrine. One of he key features on this phone is that it is very inexpensive, and yet comes with the relatively recent Android 5.1.1 OS which we see mostly on phones that cost twice as much or more. Another great point to note is that there is a GSM version of this phone and a CDMA version. Just make sure you know which version works in your area (more about this below). Of course the Citrine can't compete in performance, appearance, or functionality with devices like the Apple iPhone 6 Plus now available from Tracfone, or other high end devices, but it also doesn't have the $500 plus price tag. Let's take a look at the full features and specs for this smartphone. Below are the features for the smartphone, followed by the technical specs. Size: 4.92" x 2.56" x 0.41"
1650 mAh Battery with Talk Time 12 Hrs, Standby 10 days. Many of these features and specs are very similar to Tracfone's other devices such as the LG Rebel or Samsung Galaxy Core Prime. However, the Citrine is available at a much lower price. The main difference in the Citrine from many of Tracfone's other recent smartphones is the smaller screen size. If you notice the battery capacity, it is small, but this phone only has a 4" screen so it doesn't drain the battery as fast as phones with larger screens. Let's get into our full review of the Citrine. There's a lot of good features on this phone, specifically Android 5.1.1, 4G speeds, Quad-core processor and the low cost. Android 5.1.1 is a fairly recent version of the operating system, and generally newer is better when it comes to Android. With each new version, any bugs or security risks are usually fixed, and new features are added. For various reasons, Android phones from Tracfone do not receive OS updates, so whatever version they come with is what they will stay with. Tracfone has just released two Samsung smartphones with Android 6.0, but most of their phones use 5.1.1 or older. The Citrine comes with a Qualcomm Snapdragon 210 processor that has four cores, and runs at 1.1 Ghz. With this processor, the Citrine is capable of 4G LTE speeds, and has pretty good responsiveness. It is limited by the RAM, which we will mention more about further on. Basically, in a phone this cheap, it still has reasonably good performance. Lastly, the price is what will likely draw most of the attention to this phone. It is listed most places for $50, but also available for $30 in a variety of locations, including online. $30 is a great price for this phone. We also want to remind our readers that there are two versions of the Citrine, one with GSM capability, the other with CDMA capability. So it is available to all Tracfone users, but make sure you get the correct version for your service area. There are some drawbacks about this phone that we want to share so that you can make your own informed decision about buying this device. First of all, the Citrine has limited internal memory and only 1 GB RAM. Many of Tracfone's smartphones share the same limitations. While it has 8 GB internal memory, only about 2-3 GB is actually usable, depending on which pre-installed apps you keep/update. Because of the low amount of memory and RAM, you won't be able to load very many apps on this phone, and running multiple apps at once will cause the phone to slow down and possibly freeze. This phone is best for calling and texting, and a handful of basic apps like Instagram and Google Maps. The total space I see is 8.00GB, System Memory takes up 4.69GB and after updating the variety of apps that are mandatory and adding in apps like The Weather Channel, Facebook Messenger, Instagram, Zedge, Google Photos, Tracfone and a couple smaller apps for work I am left with 1.75GB available. Not too shabby all things considered. The Facebook app is a storage hog, so I opted to uninstall it and just access Facebook from the Chrome browser and use Facebook Messenger (since Facebook is staunchly against us accessing our Facebook messages via a browser on a mobile device). I do recommend going in and clearing the cache often (Storage>Used Space>Cached Data). The ZTE Citrine also has a small screen, just 4", which for some is a good thing, and for others a negative. If you're not sure what size screen you prefer, try visiting a Bestbuy, or other electronics store, and test different smartphones. For many, a screen size between 5" and 5.5" is preferred as it makes for easier viewing of videos, messages and everything else. Camera quality isn't great either on the Citrine, which shouldn't be a surprise at this price point. The rear camera has 5 MP and is adequate for capturing moments as long as there is good light, but the front camera, with only 0.3 MP, will struggle in anything other than good lighting. Finally, the quality of this ZTE phone is good, but nothing like a high-end smartphone. With most things in life, you get what you pay for, and the same is true for the Citrine. It does have a nice textured back, but it is made from plastic. Some readers have experienced issues with the quality of ZTE phones, such as the ZTE Quartz, and ZTE Valet. If you experience issues, we suggest contacting the retailer you bought the phone from, or contacting Tracfone. We have not heard any complaints about the quality of the Citrine, but will update as more information becomes available. Now that we've covered our pro's and con's for the CItrine, we want to answer the question, is this the best phone from Tracfone for under $50? Well, probably. A lot depends on what you're looking for in a phone, and if you're looking to use a variety of apps, you will likely be better off with a more robust smartphone. That concludes our review of the ZTE Citrine. We will share some additional information, and where to buy the phone. The Citrine is a very budget friendly smartphone that is best for those who want to use it for calling/texting and occasional web browsing, email and other basic apps. It will likely struggle at running any apps that are resource intensive, like certain newer games. This phone is most similar to the LG Lucky, also available from Tracfone. However, the Citrine is an improvement over the lucky in almost every way, with better processor, more memory, better camera, larger screen and more. You can find the ZTE Citrine available from many retailers including Walmart (GSM version, or here is the CDMA version), Target, Bestbuy, and more. The Citrine can be found online from many of the same retailers, and also on the Tracfone website. Some retailers have the phone listed for $50, while others have it discounted at $30, including the Tracfone website and Walmart. You can take a look at the ZTE Citrine interactive tutorial for help using and navigating the phone. We hope this review is helpful and let us know in the comments below if you have any further questions. Be sure to visit our Guide to Activating or Transferring Service on a Tracfone Smartphone for some helpful tips and info. We recently compared several of the latest LG phones from Tracfone and shared the results. Take a look at our LG Smartphone Comparison, with the LG Rebel, Treasure, Premier and Stylo 2. Join us on Facebook where we share our latest posts, and have a great group of followers who help answer questions. Catch up on the latest new Smartphones plus great deals and discounts on Tracfone devices in our last post. 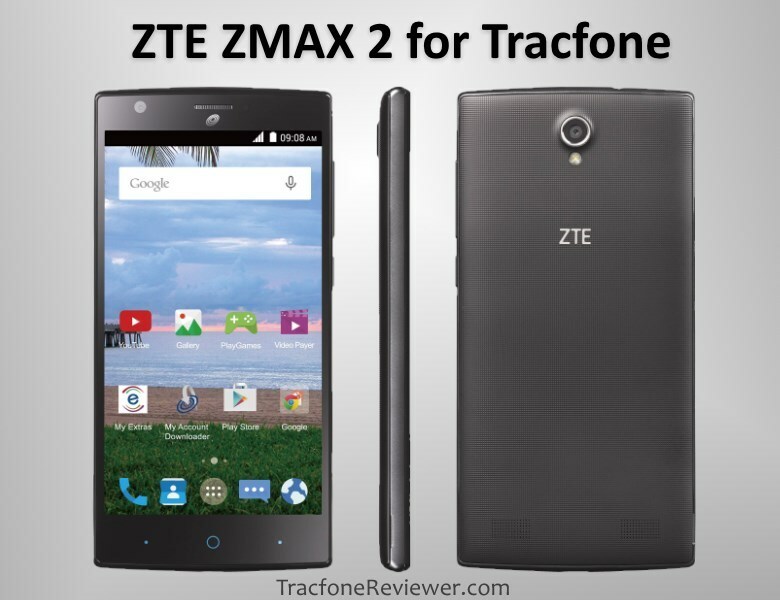 Welcome to TracfoneReviewer, a website that shares news, reviews and other information about Tracfone. 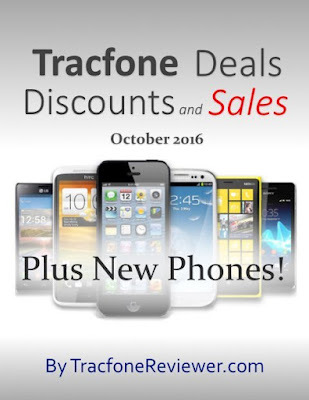 Tracfone News, Sales and More! 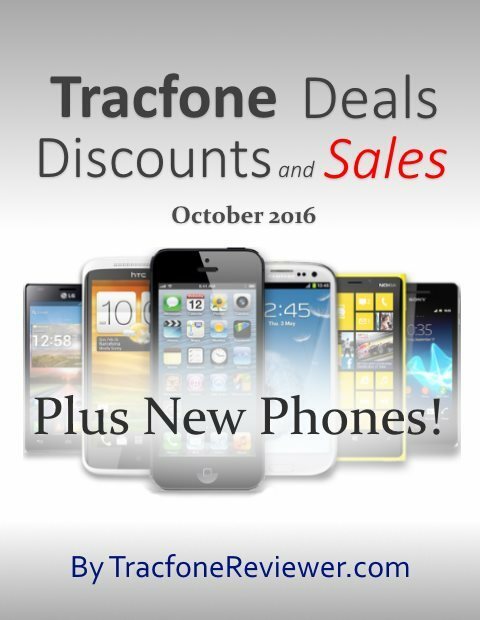 We've got the latest roundup of deals and discounts on Tracfone smartphones for October 2016, plus details on several new phones now available for Tracfone. We want to share with our readers both the latest news, and some of the top discounts or deals from around the web. Buying a new phone can be a challenging process with many options and lots of pro's and con's for each phone. We want to help by sharing a handful of phones that are either currently discounted, a great deal, or newly available for Tracfone. We will start by covering some of the new devices available, then some great deals on Tracfone smartphones, and finally some great BYOP phones to bring to Tracfone. If you're new to Tracfone, start with our Beginners Guide to Tracfone. And if you're not confident in how the activation or transfer process works, we've created a Guide to Activating or Transferring Service with Tracfone. Let's take a look at some new phones. Some of these new phones were actually released right at the end of September, but we want to include them anyway. We will add any new phones to this list as they are released. This 5" touchscreen smartphone features a 5 MP rear camera (2 MP front), 8 GB memory and Android 6.0. Besides the fact that it runs Android 6,0, which is a very recent version of the OS, the Galaxy On5 doesn't really bring any inspiring features. It compares similarly to the LG Treasure or LG Premier. It is priced reasonably however, with a minutes bundle on HSN for $149 (on sale for $109). The On5 is a 4G LTE device that uses GSM networks. The Luna is fairly similar to the On5, running the same Android 6.0 operating system. It also has a 5 MP camera, 1 GB RAM, 8 GB Memory and quad core processor. The screen size on the Luna is slightly smaller than the On5, at 4.5", which some of our readers prefer. The Luna uses CDMA networks and has 4G LTE capability. You can find the Samsung Galaxy Luna on QVC with an airtime bundle (1200 minutes) for $121, now on sale for $99. The airtime alone is worth $100. The ZTE Max Duo is the type of phone many Tracfone users have been hoping Tracfone would release for a long time. It features 16 GB internal memory, a 1.5 Ghz octa-core processor and 2 GB RAM. It also has a full HD, 6" touchscreen with Gorilla Glass for extra durability. One of the interesting features on the Max Duo is the dual rear camera. It has two rear facing cameras, one is a 13 MP camera, the other a 2 MP camera. Plus a 5 MP front facing camera. There are a lot of great things packed into this phone, and it is currently available through HSN with minutes bundle for $249 (on sale for $199). Expect to see more information about this phone from us in the near future. The first Android smartphone that is a flip phone. If you just can't give up the flip phone, this might be the upgrade you're looking for. It runs Android 5.1.1, has a 5 MP camera and WiFi. This phone is CDMA and has 4G LTE capability. Right now we've only found it on BestBuy for $70, and no info on how it performs, but look for more in the near future. We also want to mention the iPhone 6 and 6 Plus which Tracfone released in September. You can learn more, and see full specs and prices, by visiting our Tracfone iPhone 6 and 6 Plus post. Now we want to share some great deals or discounts on Tracfone devices from around the web. If you find other deals, or better deals, be sure to share them in the comments below! The Moto E was first released several years ago, but it still can work as a basic smartphone, running a handful of apps, and useful for checking email or weather. It comes with a 4.3" touchscreen, Android 4.4 and 5 MP camera. See more about the Moto E including specs and features. Another low-cost smartphone option, the Lucky also runs Android 4.4 and has a 3.8" screen. As with the Moto E, it isn't a very powerful device, but good for basic smartphone functions, and, of course, calling and texting. With this bundle on eBay, you get the LG Lucky and a 200 Minute Airtime card, which is worth $40. At the price, it makes a great backup phone, or device for kids. The LG Lucky uses CDMA networks while the Sunrise uses GSM. Learn more about the Lucky in our Full Review. We like to include a non-smartphone option for those who are not interested in upgrading to an Android device. With non-smartphones, you get to keep all your airtime in one 'pool' and Tracfone Promo Codes will work on your device. However, non-smartphones are generally very limited in their features, and are best for simple calling and texting and usually not much more than that. The LG 306G has a 3.2" touchscreen, and uses a java based operating system. It is a popular Tracfone device, although many users end up getting tired of the lack of features, and upgrade to a smartphone. Get full specs and more information in our full review of the LG 306G. If you would rather have a flip phone, there are two options on Amazon that are currently $15 each. The LG 237C and the LG 441G are basic flip phones from Tracfone that use 3G networks. These are good for daily use, or as a backup. They don't do much beyond calling and texting, but have a long battery life and great durability. That concludes the deals we've found on Tracfone devices, let's look at some great BYOP options. Using the Tracfone BYOP program opens up many more options for phones, and many great value devices. Below we will share some of our top picks for unlocked smartphones to use with Tracfone. At just $109 for 2 GB RAM and 16 GB Internal Memory, there are few phones that can compete with the value the R1 HD offers. Many Tracfone smartphones retail for over $100 and only have half the RAM and memory. The BLU R1 HD has received good reviews for being a budget smartphone, and if you're looking to get the most bang for your buck at the $100 range, this might be the best option (unless you go with a refurbished phone). The Moto G4 is the latest in a line of popular budget smartphones from Motorola. At a very reasonable price point, it packs a lot of features and value into the $199 price tag. Many see the Moto G4 as the best budget smartphone available. It has a large, 5.5" touchscreen, 13 MP Camera, Octa Core processor, 2 GB RAM and 16 GB Memory. For an extra $30 you can get 32 GB memory.$199 for the features and performance this phone offers is a good deal, and it is compatible with both GSM and CDMA cell networks, making it easy to bring to Tracfone BYOP. For those looking for more, the Moto G4 Plus delivers, with more RAM and Memory. The G4 Plus has 4 GB RAM, and 64 GB internal memory (there is also a version with 2 GB RAM and 16 GB memory for $249), features we rarely see on a phone at this price. The extra RAM (compared to the 2 GB on the G4) means that the G4 Plus can handle more operations at once, it can run more apps, or more demanding apps, without slowing down. The G4 Plus also has a 16 MP camera and fingerprint reader. The Huawei Honor 5X is another budget friendly smartphone packed with great features. This phone has many similar features to the Moto G4, such as a 5.5" touchscreen, 2 GB RAM, 16 GB memory and 13 MP camera. But it also has two additional features - a finger print scanner and all aluminum body. The Honor 5X is certainly a worthy phone to consider along with the Moto G4. Learn more about the BYOP program, and see a full list of many more smartphone options, on our Tracfone BYOP page. That concludes our roundup of new phones, great deals and discounts, and popular BYOP devices for October 2016. We hope this information is useful, especially if you're considering buying a new phone. Leave a comment with your thoughts or questions below. Also Follow us on Facebook (where many of you already do!). We share the latest posts, news and answer questions. Our recent post, 4 Ways to check your Airtime on a Tracfone Smartphone may be very helpful for those who like to keep track of their minutes. We also did a full Tracfone Airtime Comparison to see which airtime cards from Tracfone were the best value. 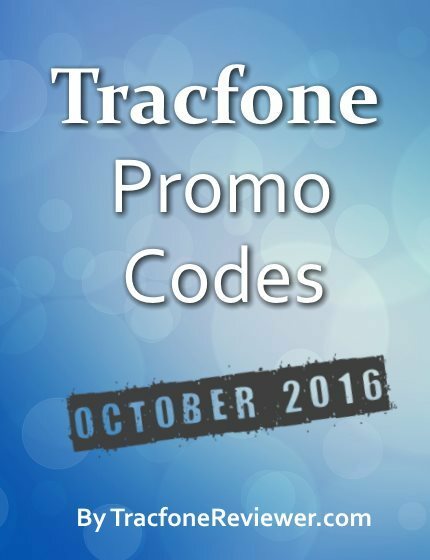 Below are the latest promo codes for Tracfone for October 2016. Each month TracfoneReviewer collects and shares these codes for our readers to freely use and share. Be sure to take a look at some of our other Tracfone related content including reviews and other information here on the blog. Winter is coming, but to help hold off the cold we've got hot new promo codes for Tracfone! Tracfone provides these codes for their customers to use and get bonus minutes whenever they add an airtime card. Promo codes are for use with a specific card, but can also be used with cards of greater value. Promo codes do not work on Android phones. There has been some confusion about this, but from the first smartphone Tracfone released, they haven't allowed promo codes to be added. But, all smartphones come with Triple MInutes for Life (for regular airtime cards) and are a pretty good deal. Below you will find just the latest promo codes for Tracfone that are valid for October. But we also have a much more comprehensive collection of codes on our main Tracfone Promo Code page so take a look if you want more codes to try. If you're considering buying a new phone, check out our Cell Phone Reviews page where we list all of our reviews of Tracfone devices. You can also take a look at the details about the Tracfone iPhone 6 and 6 Plus now available. Below are the codes, remember, some codes can only be used once/ Also, these codes won't work on for smartphones. These are the latest promo codes to use with Tracfone when adding a new airtime card. We hope these codes worked for you! Share your results in the comments below. We recently created a Guide to Activating or Switching to a Tracfone Smartphone/BYOP device and we also shared 4 Ways to Check your Tracfone Balance on a Smartphone. These might be helpful if you're considering a new smartphone from Tracfone. If you've got questions, or just want to keep up with the latest news and information, join over 2000 others who Follow us on Facebook. We share the latest posts, and various deals or updates from time to time. Finally, we also created a comparison of the latest LG smartphones available from Tracfone to help our readers decide which device is best for them. We've got lots more information and reviews coming soon, including a guide to buying non-smartphone devices from Tracfone, so stay tuned!